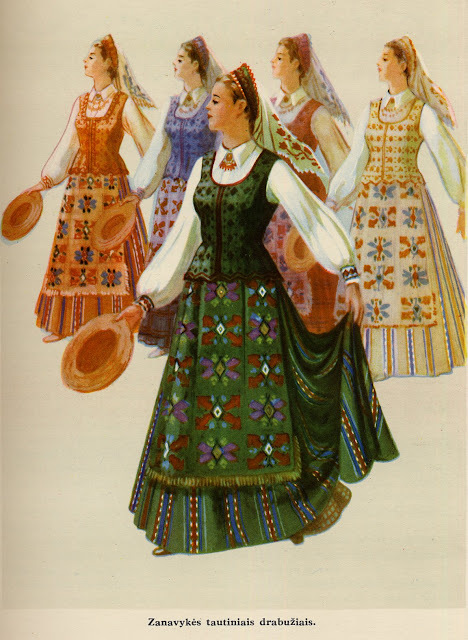 Today I am continuing my series on Lithuanian Costume, with a look at the costume of the region of Zanavykija also spelled Zanavykia or Zanavykai.. 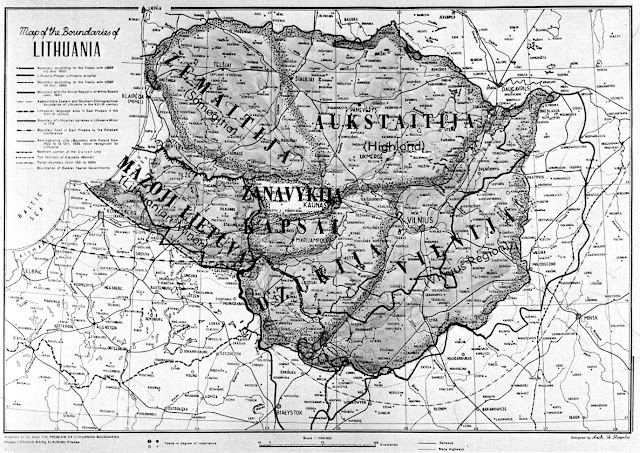 This is often grouped with the region of Kapsai to form the larger region of Suvalkija [Suvalkia]. There are many similarities between the two costumes, but there are also definite differences, so i will treat them separately. For more general information about this region, see this article. This area had been rather depopulated because of war, and new settlers came here from Samogitia and Lithuania minor. This was one of the last regions to develop a particular costume, and the costumes of this area are very impressive, being from a fairly prosperous region. Here is a map showing the region of Zanavykia. As you can see, it is bordered by Samogitija or Žemaitija on the north and Kapsai on the south. There are similarities to each of these regions. 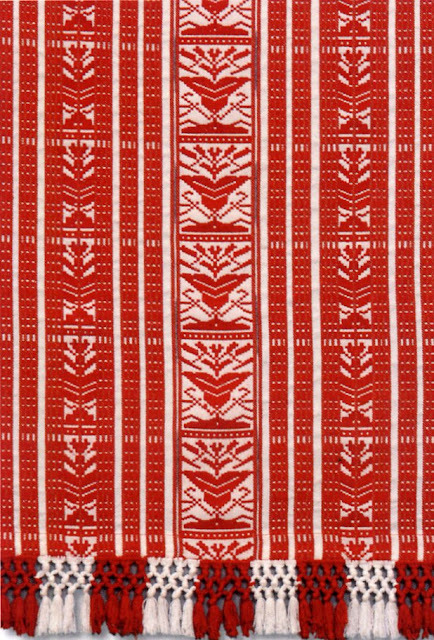 The folk costume of Zanavykija is characterized by strong rich colors and a love of vertical stripes, as in Samogitia, and rich detail of ornament, especially overlay woven designs on the apron, as in Kapsai. 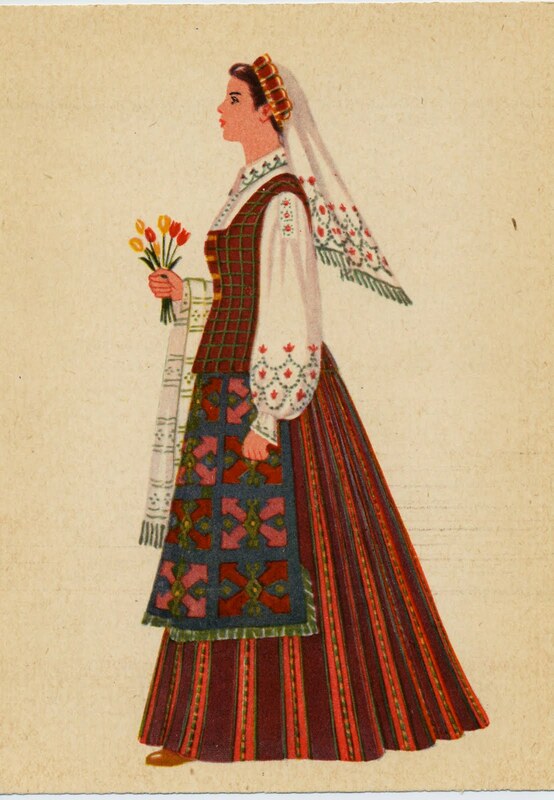 Typical motifs are the Tulip and the star.. Here are a couple of depictions of this region's costume by V. Palaimas. 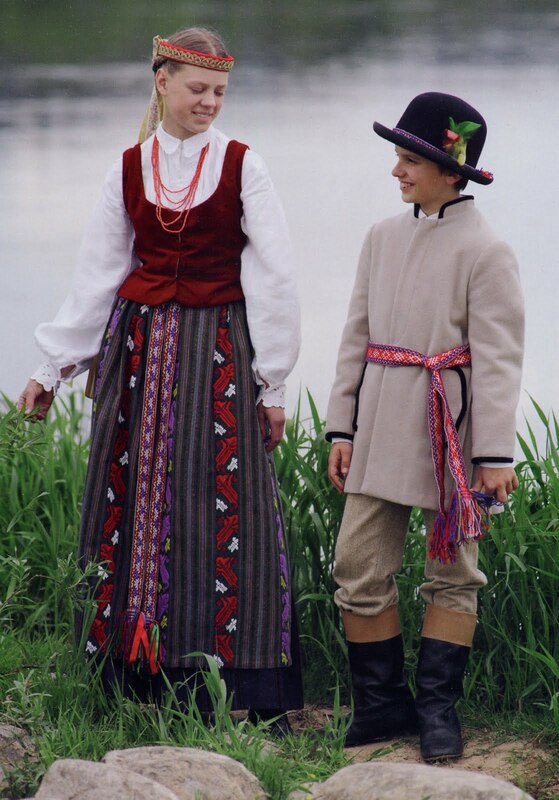 And a couple from Jurkuviene. 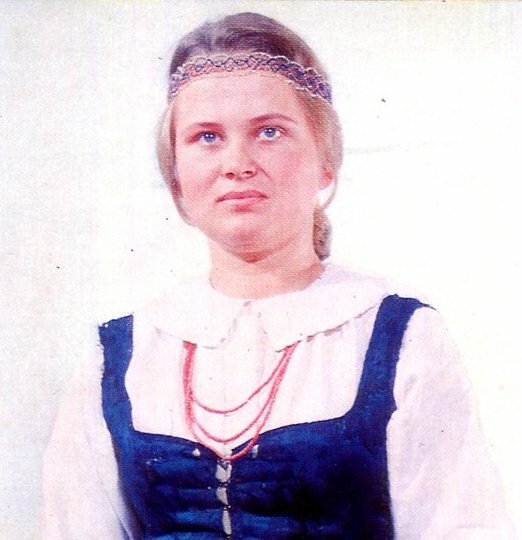 The chemise is the standard tunic cut typical for Lithuanian, historically with narrow shoulder bars. 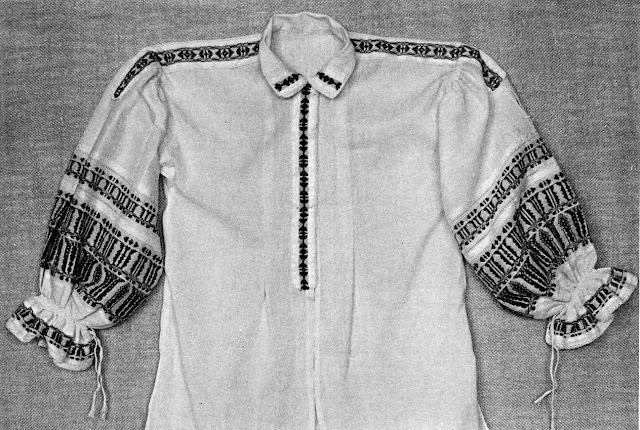 There was woven in ornament on the lower sleeves, or just on the cuffs, or none at all, as you can see in the various images above. The tulip became one of the most popular motifs here, as in neighboring Kapsai.This was developed even further in the 20th cent. The sleeves of dress chemises were very full, with gathers at the top of the sleeve. 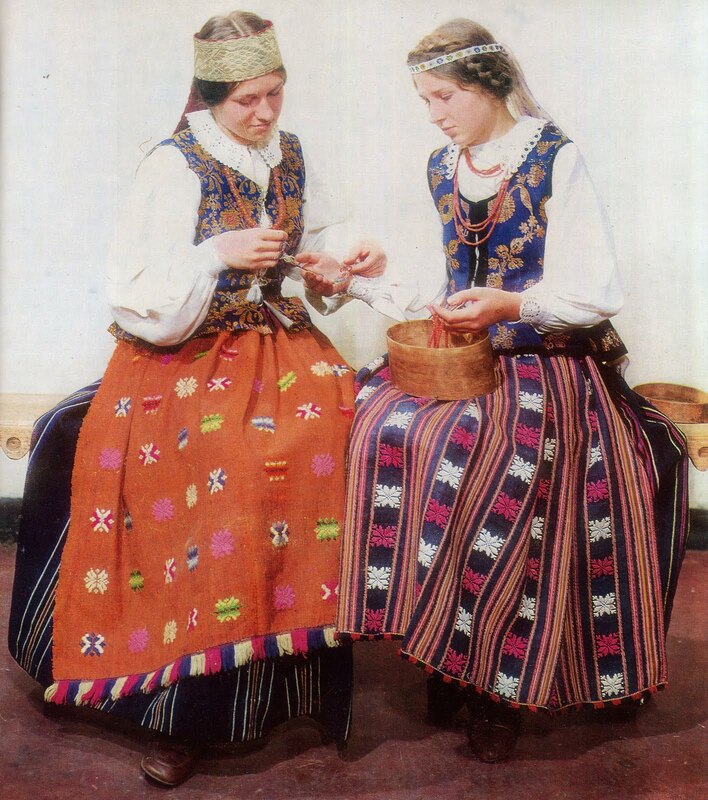 Later, some of the chemises came to be embroidered, sometimes with cross stitch, in black or red, or other stitches. 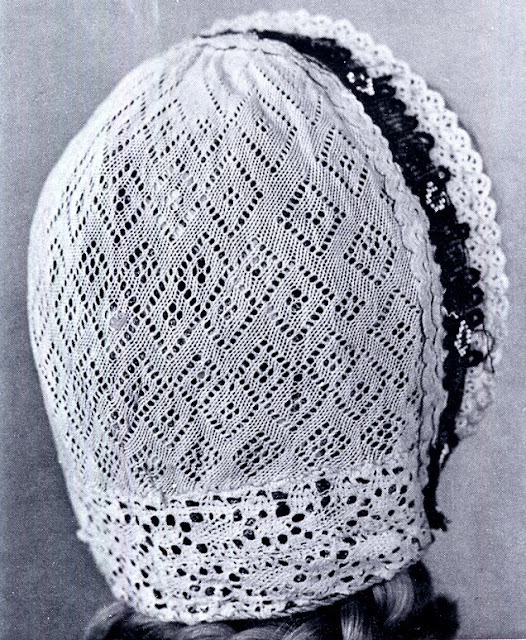 For a while, Broderie Anglaise was popular. When the chemise was embroidered, the shoulder piece was often widened. 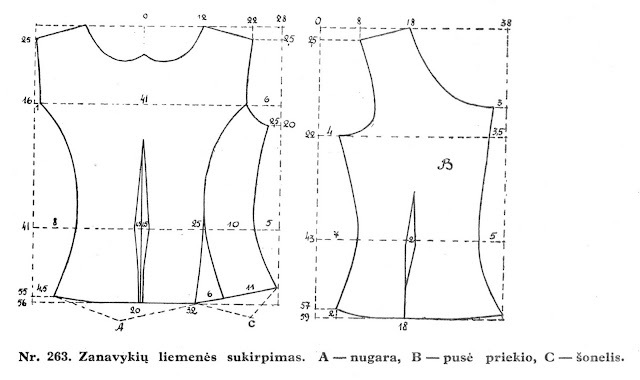 Already in the 19th cent., sometimes the dress chemise was separated into two garments, a blouse and a petticoat. 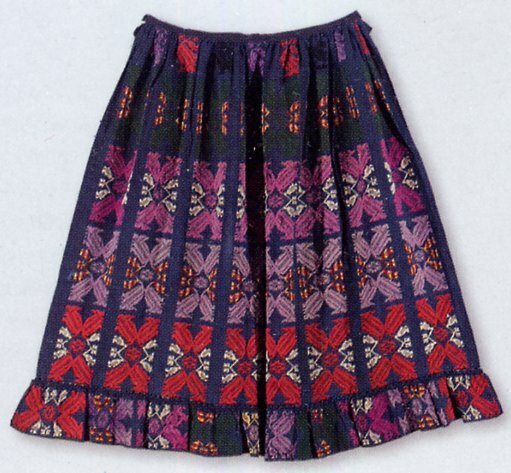 It was especially popular to do Broderie Anglaise on the petticoat. The skirts in this region were exceptionally full. 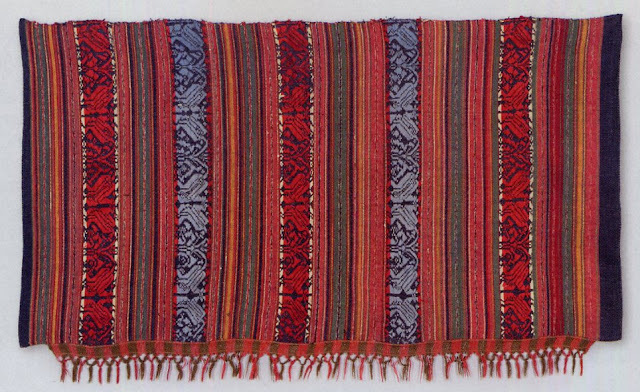 Sometimes plaid, but most commonly various srtipes on a solid background were woven horizontally but worn vertically. Examine the various images given. The aprons of this region, together with those of Kapsai, are exceptionally colorful and elaborate. 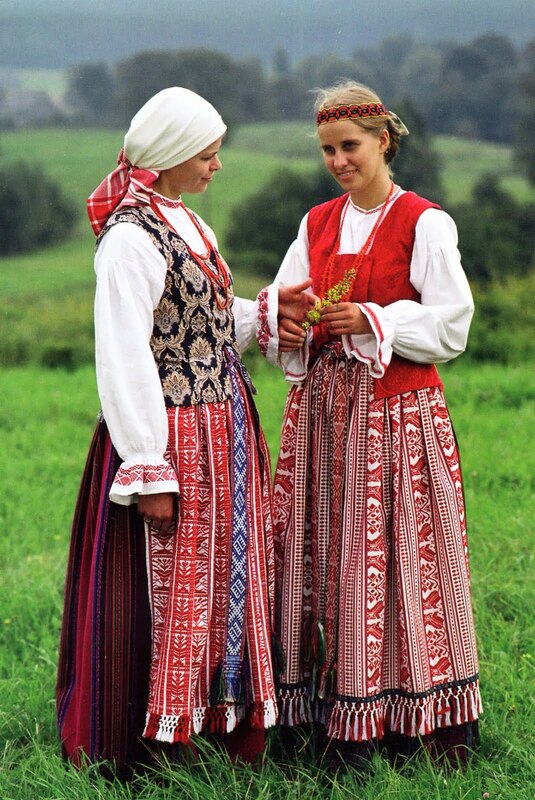 The early aprons were like those of the two girls in the field above. Red stripes of designs on a white background. 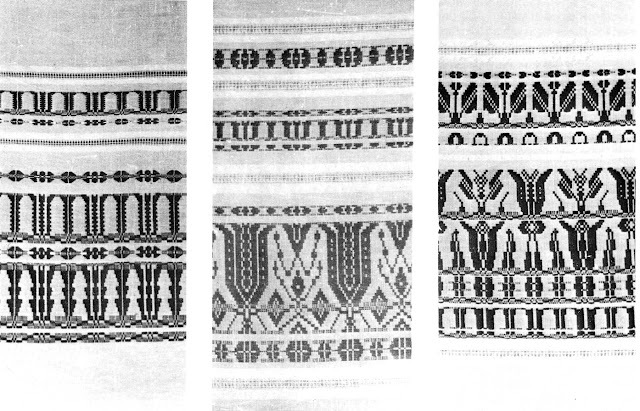 These resemble some aprons of Lithuania Minor, and may have been copied from 18th cent. brocades. The prominence of the tulip motif is already present. These were later on made in other colors, to complement the entire outfit. They were still made in vertical stripes, however. A later development is the overlay weaving of spot designs in various colors, usually four tulips forming a square. This motif has almost come to be considered a symbol of Lithuania. Sometimes the result was a number of motifs in a checkerboard, but there was always at least a conceptual possibility of vertical stripes. A flounce was sometimes added at the bottom. 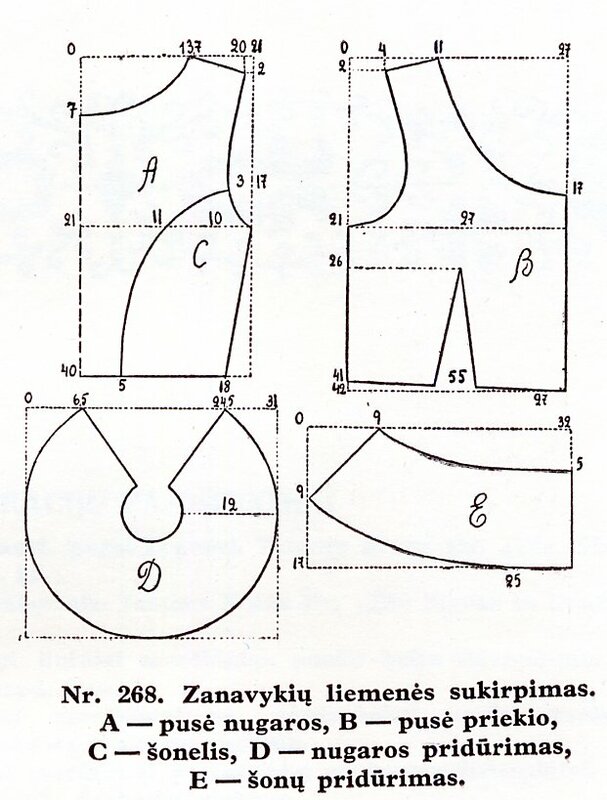 The earliest type of bodice used in Zanavykia consisted of four pieces of material which were sewn down to the waist, then left to hang free below that. It also had a shorter piece in front which connected the two sides. 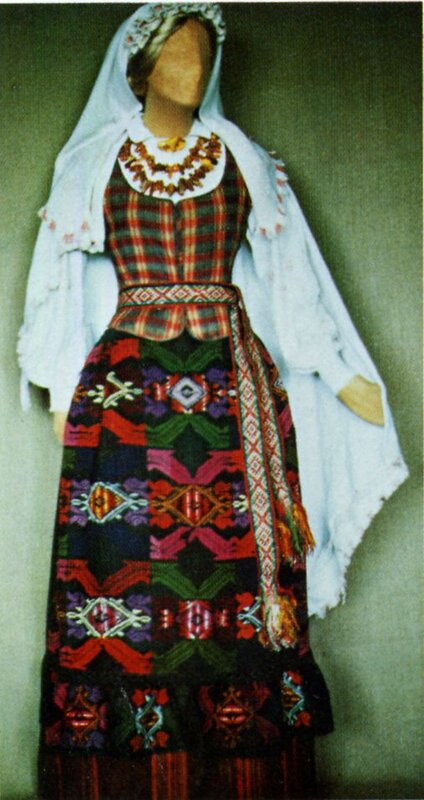 This type of bodice is today considered to be most typical of Dzukija, and it was soon superceded in Zanavykia by two other cuts. 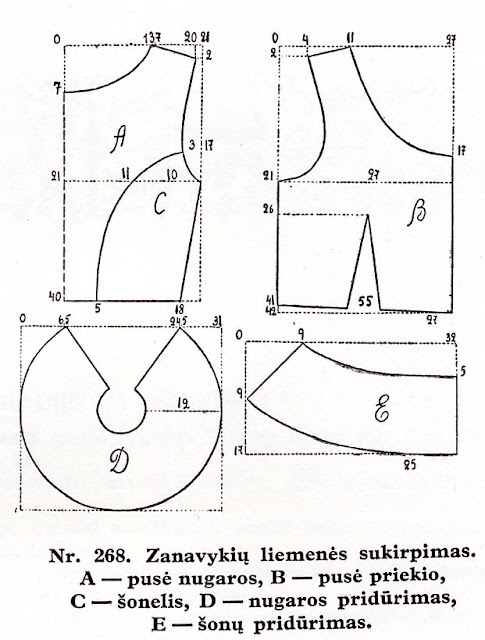 All of the cuts used in Zanavykia were short, coming only a few inches below the waist. It was made of many different materials, both home woven and bought. Here is the more generic cut. Front and back view and schematic. There is another cut which is distinctively unique to Zanavykia. 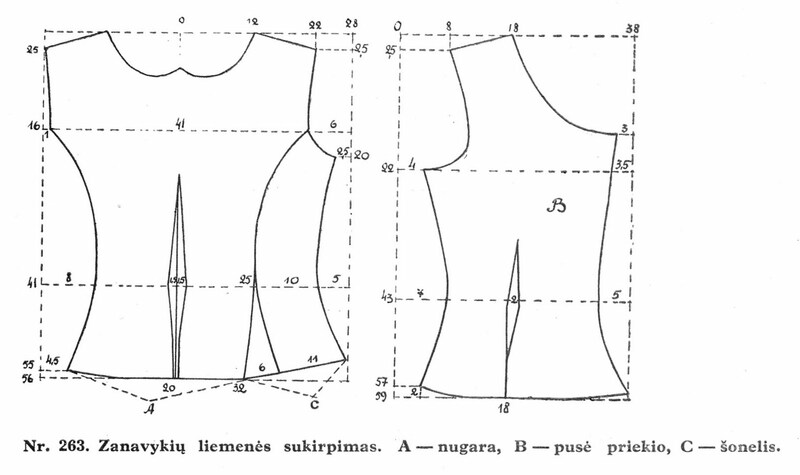 The bodice is cut close to the waist, and below that is added a peplum which flares dramatically. Here are a front and back view and schematic of this cut. 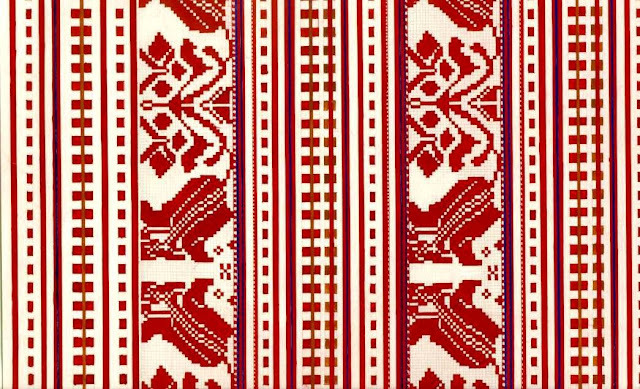 The sashes in this region were particularly wide and woven with striking motifs, often with a central design and two narrow borders. They were always fringed, and as in other regions of Lithuania had crosswise supplemental fringes woven in weftwise, as well. Observe the variety of sashes in these images. In Zanavykia, unmarried girls wore gallons on the head, as in other regions, sometimes the common wide ones, but very commonly narrower ones as well. Examine the various images above. 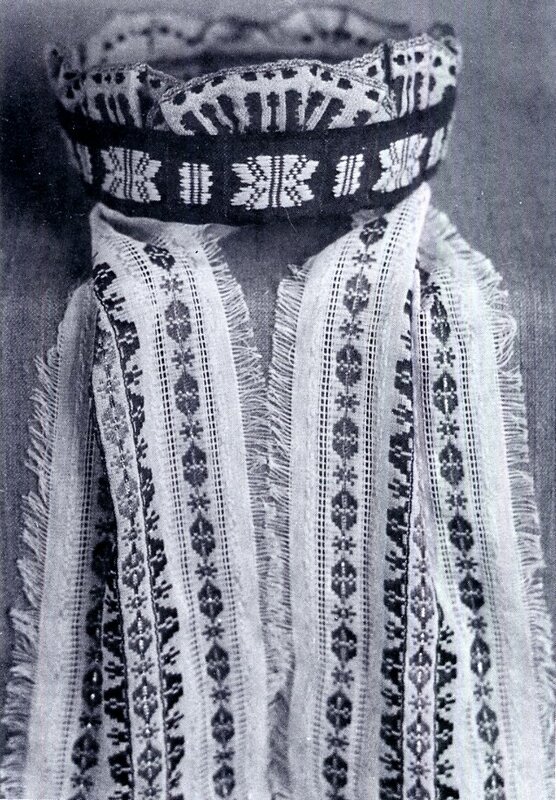 One type of headgear unique to Zanavykia are beaded headbands which came in a variety of styles. Here is a closeup of the image just above. Compare with the photos earlier in the posting. The karuna, or maiden's crown was also worn in this region. 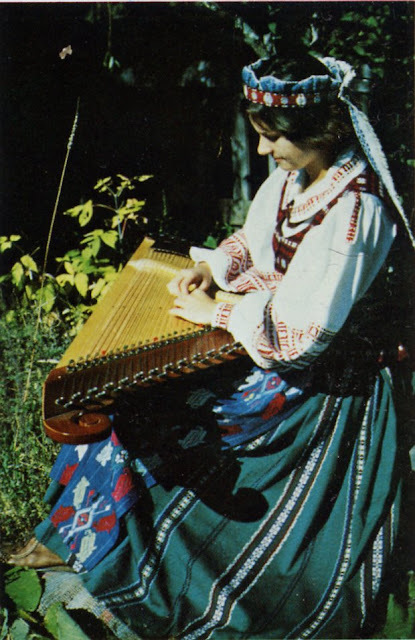 As usual, it was based on a ring of birchbark, later replaced by cardboard, with woven ribbons attached to the front and back Along the crown, short lengths of patten woven ribbon were accordian pleated into semicircles and attached to the back of the top edge. In back, of course, patterned ribands hung down from a bow. 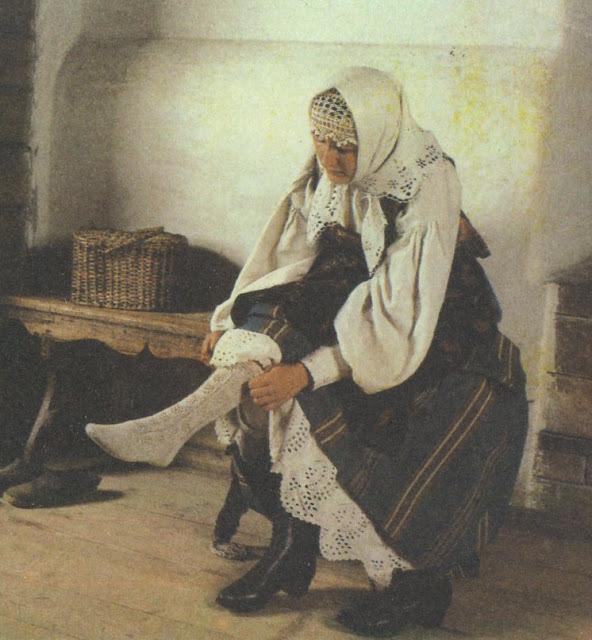 After the Nuometas, the wimple, was abandoned in this region, married women would wear a netted cap. Thread was warped onto a rectangular frame, and the threads are crossed in definite patterns, being held in place by a stick similar to a shuttle. At the end, one had two pieces worked in identical patterns, top and bottom, with straight strings in between. This technique is somewhat similar to macrame, and resulted in a very flexible and stretchable textile. 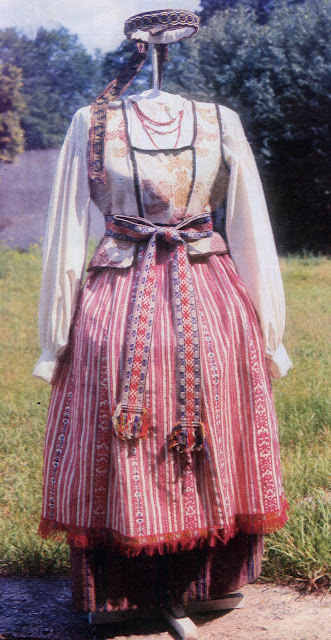 This was used for women's hair coverings over a wide part of eastern Europe. Here is an example, the front of it is edged with ribbons pleated and arranged as in a girl's karuna, and there is a beaded band just behind the pleated ribbons, a combination typical of Zanavykia.The back edge is finished off with bobbin lace. When going outside, a kerchief was put over the cap, which was sometimes reduced to a frontlet of pleated ribbons. Later on, the pleated woven ribbons were attached directly to the kerchief, and the headgear was made up just of the one piece. 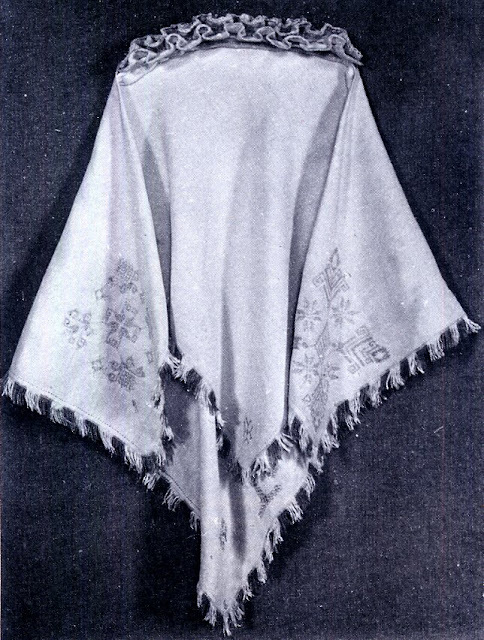 The kerchief in this region was often embroidered, either in cross or stem and satin stitch, or in Broderie Anglaise, with cutwork and scalloped edges. Again, take another look at the various images above. Here is one such kerchief with embroidery, fringe and front piece attached. Thank you again for reading, i hope that you have found this interesting and perhaps even inspiring. 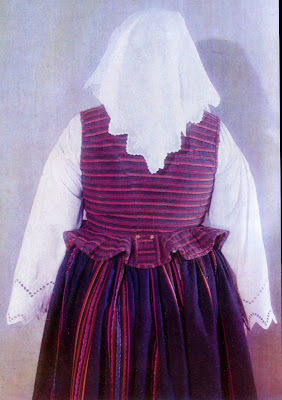 Jurkuviene treats this costume together with the one from Kapsai in her article.on Suvalkija. What a wonderful article. I really enjoyed it. 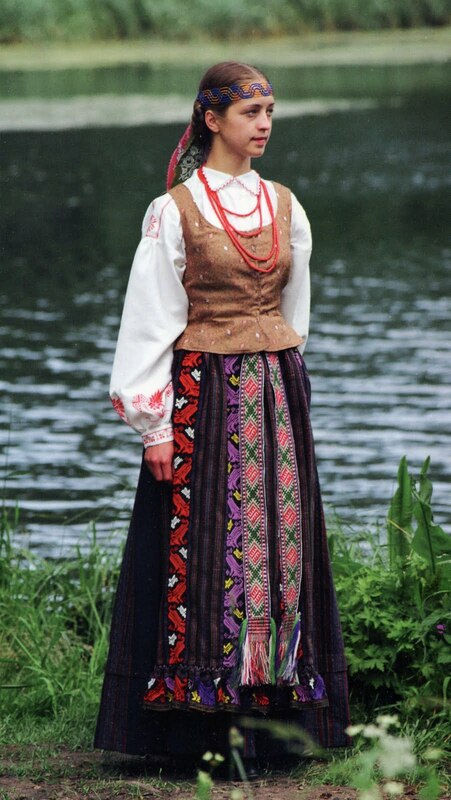 I am a Lithuanian American. Thank you. I sm glad that you found this to be useful.